hello - this little Hootie is tellin' you "hello". This week at ColorThrowDown #154 they are challenging us to use Old Olive, So Saffron, Daffodil Delight and Dark Gray. The little Hootie was created using my punches. If you'd like to learn how I'd be glad to demo it for you and a few of your closest friends. It's all about Stampin' Up! here from the cardstock to the ribbon to the brads to the stamps to the punches. Enjoy! Hey Betty!! Really gorgeous card hun!! LOVE the colors here!! :) Hope all is well!! Great card, Betty! That owl is cute! Thanks for joining us for the Color Throwdown! So cute! I love the little wings you've created! Very clever! Thanks for playing with the CTD colors this week, we always appreciate your creations! 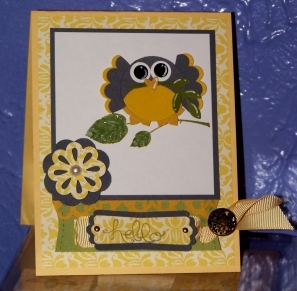 Oh my goodness, Betty, your little "Hootie" is so cute! My granddog's name was Hootie too. Thanks for playing along with us and have a great week!